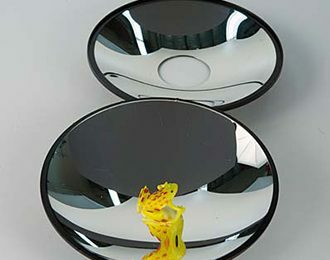 These two concave mirrors create a real image of any small object you place at the bottom. The image appears at the opening at the top and when students try to touch it, they find that it is only an image, and not the real thing! A great demo for teaching the concepts of real and virtual images, focal lengths, reflection, and ray tracing.